Charles Bennett, the Alumni Centennial Professor of Physics and Astronomy, winner of some of the most prestigious prizes in his field, a scientist who is credited with leading the team that pinpointed the age of the universe to better than 1 percent accuracy, is talking about time machines. Enter CLASS, the Cosmology Large-Angular Scale Surveyor, a telescope being built in labs at the Krieger School’s Bloomberg Center for Physics and Astronomy. Bennett and Assistant Professor Tobias Marriage are leading the charge to build CLASS which, when completed, will be used to study the oldest light in the universe and help answer one of the most fundamental questions asked by astrophysicists: How did it all begin? Of course, you need something to see it with. Light from the sun may take eight minutes to reach Earth, but it has taken light from the beginning of the universe 13.8 billion years to reach our planet. When operational at the end of this year, the first of CLASS’s four-telescope array will begin analyzing the cosmic microwave background (CMB), the faint afterglow of energy released during the first trillionth of a trillionth of a trillionth of a second of the universe’s existence. Astrophysicists hypothesize that within that fraction of a second, what we know as our “visible universe” suddenly expanded from smaller than an atom to astronomical in size. It’s a theory known as “inflation,” and so far, it’s the best explanation for what happened in the very first moments of the universe. But, like any theory, it requires observational verification. 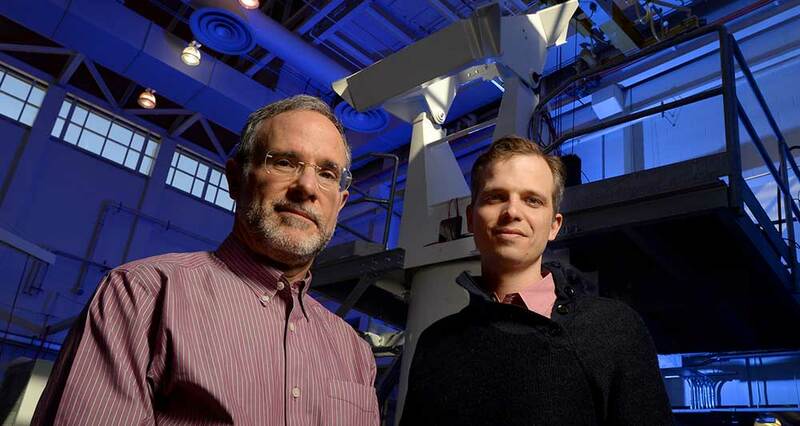 Professor Charles Bennett (left) and Assistant Professor Tobias Marriage are building a world-class telescope. 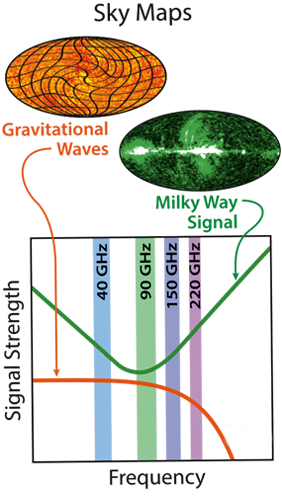 According to the theory, gravitational waves were produced during inflation, imposing a polarization pattern on the CMB. This past March, researchers from the Background Imaging of Cosmic Extragalactic Polarization (BICEP2) collaboration, a multi-institution partnership, announced that they had found the first evidence of the gravitational waves that would verify the inflation theory. “Up until now most thought that this signal would be far too weak to detect, but the recent claimed detection has changed all that. The brightness was reported to be far above expectations based on the broad set of current cosmology data,” says Bennett, who joined Johns Hopkins in 2005 after 20 years at Goddard Space Flight Center. There remain two questions: Is the evidence correct? And, if so, what does it mean for cosmology? To address these issues, Bennett and Marriage say additional independent data are urgently needed. “CLASS is well-positioned to do this,” Bennett says. “It is unique because it uses different technologies and observes most of the sky at multiple different frequencies. The BICEP2 telescope, located at the South Pole, was limited to a single small patch of less than 1 percent of the sky.” Verifying the BICEP2 data and obtaining additional data are essential to answer the question, How did the universe begin? Marriage came to Johns Hopkins the same year Bennett received the NSF grant, and their combined expertise created the ideal synergy to move forward. Astronomers often build telescopes on mountain tops to get them above as much of the atmosphere as possible for a clearer view of space. Atmospheric water vapor is particularly problematic, so astronomers look for sites that are high and dry. The two options for CLASS were high in the Andes mountains of northern Chile or near the South Pole. 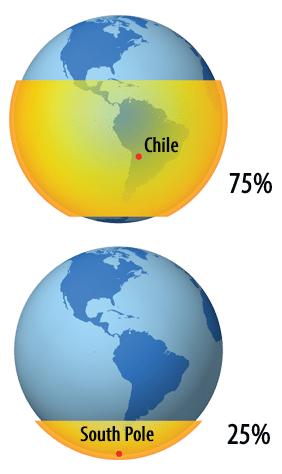 Chile’s Atacama Desert was selected as the ideal location for CLASS. It is one of the best places in the world to conduct astronomical observations. Unlike telescopes located at the South Pole, which have a restricted view of the sky, CLASS will be able to survey about 70 percent of the sky by taking advantage of its near-equatorial latitude and the Earth’s rotation. This would be impossible from the South Pole. Marriage hails from Princeton University, where he was a postdoctoral researcher in astrophysics. He is no stranger to Chile’s Atacama Desert, where CLASS will be located. Marriage spent nearly a year on the same desert plateau, where astrophysicists from a Princeton-led collaboration had built the Atacama Cosmology Telescope or ACT, which studies fine-angular scale structure in the microwave background. Marriage played a leading role in building that telescope and used ACT data to discover giant galaxy clusters, including the most massive gravitationally bound structure in the observable universe, nicknamed El Gordo. The Atacama Desert is a brutal place. Stretching 600 miles from Peru’s southern border into northern Chile, the Atacama is the driest place on Earth, what climatologists call an “absolute desert.” There are vast swaths of land where no rain has ever fallen, at least since humans have been recording such things. No grass. No trees. Just towering white-capped volcanoes that stretch along the continental divide, reaching 20,000 feet. It’s been compared to the surface of Mars, and, in fact, NASA has used it extensively for testing. And because of its dryness, high altitude, and lack of cloud cover and light pollution, the Atacama is one of the best places in the world to conduct astronomical observations. 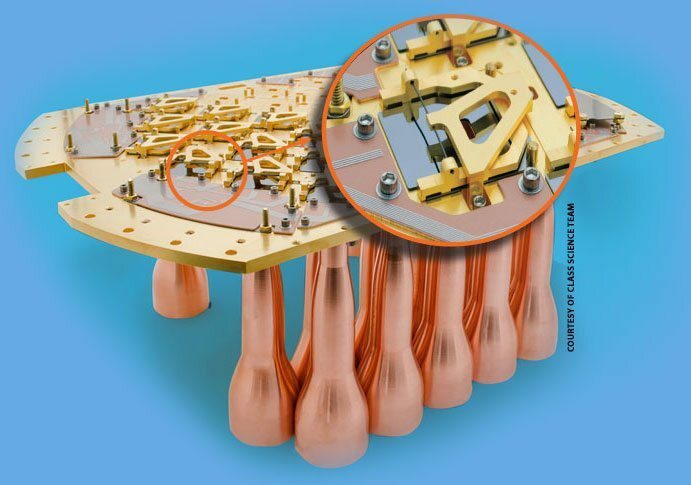 In designing CLASS, the challenge for astrophysicists was to create a telescope sensitive enough to detect polarization from the CMB while using new technology to rapidly modulate incoming signals, distinguishing the desired gravitational waves from all the background noise in the universe. In Bennett’s and Marriage’s laboratories on the second floor of the Bloomberg Center, the telescope’s systems are being designed and assembled. There’s a sense of urgency now, as the team knows its deadline is approaching. CLASS is searching for a particular pattern in the ancient cosmic microwave background. It is imperative to distinguish the primordial pattern from imposters coming from within the instrument, from the telescope environment, or from our Milky Way galaxy. The CLASS telescope uses new technologies to observe at multiple frequencies and rapidly modulate the incoming signals. These and other steps will enable CLASS to robustly differentiate the faint primordial gravitational waves from more local and mundane effects that might otherwise mimic the target signal. A cadre of eight undergraduates, six graduate students, and four postdocs, plus additional research faculty members, are working on CLASS at any given time. Marriage works directly with the students and postdocs to design, build, and qualify state-of-the-art technology for CLASS, including the optical instrumentation and a shield to protect the detectors from the Earth’s magnetic field. Marriage also guides the creation and implementation of detailed computer simulations that inform the effort, and he ensures that the moving parts are progressing in unison. “I make sure the pedal is to the floor,” he says. The lab that holds CLASS contains several rooms, and a wide-open space that looks something like a high-tech machine shop. Katie Harrington, a graduate student, is using a mill the size of a small car to fabricate prototypes of the telescopes’ 40-centimeter lenses for testing. The lenses will be made from high-density polyethylene—the same material used to make cutting boards. The actual lenses will be covered with an anti-reflective coating and sit behind a wire-array modulator, a key component used to filter out unwanted noise. For Harrington, the work is a dream-come-true. The team holds weekly meetings to ensure everyone is on the same page, go over what needs to be done, and share results thus far. Two stories below, in the hangar-like “high bay lab,” two of the telescope’s pedestals sit side by side. Their white shafts are as thick as redwood trees and reach nearly two stories tall. Several wrenches the length of a man’s arm lie strewn about, ready to tighten bolts bigger than a doughnut. Metal stairs on each pedestal lead to platforms where various control panels, power units, and support hardware for the cryostat units will be kept. The cryostat chamber, a cylinder about two meters long, will cool the system to a frigid tenth of a degree above absolute zero, helping to reduce unwanted interference. When the telescopes are finally completed, they will reach nearly twice as high. The team will rigorously test its systems, checking for any hiccups or malfunctions, and hoping that anything that could go wrong goes wrong here and not in the Chilean high desert. “You don’t want to do any hard thinking at 18,000 feet,” says Bennett. After everything checks out, the team will disassemble what they’ve painstakingly put together, pack the equipment into a shipping container, and load it on a ship at the Port of Baltimore for transport to Chile. After construction crews prep the site, a cadre of faculty, graduate students, and undergrads will fly to South America and reassemble the telescope. Six months later, they plan to do the exact same thing with the second telescope, and then a third, and a fourth. Each will scan the sky at different frequencies. A team of two will operate the array from a control room made from converted shipping containers on-site, collecting raw data and beaming it to a field office in San Pedro. The first telescope will begin collecting data immediately, and if all goes according to plan, by 2017, all four will be searching the heavens. Given the brightness reported by the BICEP2 detection, it shouldn’t take long for the CLASS team to have definitive answers. If the BICEP2 observation is correct, CLASS will be able to confirm the data. The telescope will also be used for other experiments, providing a very detailed map of the magnetic fields within our own galaxy and the first picture of the reionization signature of the CMB by an Earth-bound telescope. For now, the CLASS team can’t wait to get their instrument to first light. Even Bennett, a veteran of this sort of thing, seems to be just as excited with the potential of CLASS as he was when he received his first telescope in the ninth grade. And how much we will soon discover. An intermediate stage of the construction of one of the four CLASS detector assemblies. Microwaves from the sky are captured by the CLASS telescope optics, which focus them onto the openings of the ice cream cone–shaped “feed horns” (copper, facing down). The carefully sculpted feed horns precisely guide the microwaves to state-of-the-art custom-built CLASS detectors. The detectors, each a thin square of about an inch, are mounted by clips onto the top side of the large plate. This entire assembly is cooled to less than a tenth of a degree above absolute zero temperature to attain the needed sensitivity. The collection of feed horns and detectors simultaneously observes the sky. The pictured assembly contains 36 of 2,554 feed horns, all constructed in the Bloomberg building.